Eric Roberts is an Academy Awards nominee for his role in Runaway Train and a three-time Golden Globes nominee for Runaway Train, Star 80 and King of the Gypsies . He also won a Golden Satellite Award for the 2002 season of Less Than Perfect . He also made a profound impact in the Emmy nominated television adaptation of Truman Capote's In Cold Blood , directed by Jonathan Kaplan and co-starring Anthony Edwards and starred in La Cucaracha , which won Best Film at the Austin Film Festival in 1998, and for which Eric won Best Actor in the New York Independent Film Festival that same year. Eric's starring role in the film, It's My Party , received critical acclaim at the 1996 Sundance Film Festival . Eric has diversified very recently, appearing in Sophie Muller's Mr. Brightside video for The Killers, Brett Ratner's video for Mariah Carey's Emancipation of Mimi - Both award winners, and the Akon and Eminem video for Smack That . Other notable performances include his roles in Final Analysis, The Pope of GreenwichVillage, Raggedy Man, Babyfever, Heaven's Prisoners, The Specialist and The Grave. Eric Roberts was recently seen in Christopher Nolan 's Batman - The Dark Knight , along with one of the most incredible casts ever assembled. This follows a stint on Heroes - A job that ranks as one of Eric's favorites. Eric strives to be associated with more comedy, hence will be appearing in a Larry The Cable Guy movie, Witless Protection. 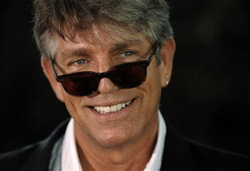 Eric Roberts was born in Biloxi, Mississippi and grew up in and around Atlanta, Georgia area. He began his career as an actor in his late teens in New York City. In 1989 Eric won the Theatre World Award for his role on Broadway in Burn This . He returned to the New York stage in 2003 in The Exonerated , which he appeared in as part of their touring company as well.